Buffing up is one of those things you see teen boys doing a lot. But what they fail to do is some Tongue Buffing Exercises. Check out all the cool moves you can do below… (and this is just part one)! Al-lisaan: contains makhaarij for 18 letters. These are divided across 10 points of articulation, which are categorised as 4 main areas. These are: Aqsal-lisaan; Wasat Al-lisaan; Haafat Al-lisaan; and Ra’s Al-lisaan. Let’s look at some of these in detail. This area is divided into two points of articulation. 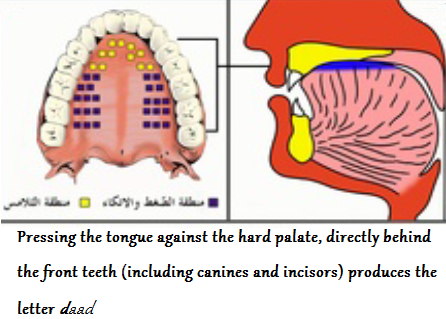 This area is the closest to the throat, and qaaf is produced with isti‘laa’  (heaviness or pressure); more correctly, however, isti‘laa’ is the elevation of the tongue towards the roof of the mouth (to that which is opposite to it) after the sound is produced. This area is slightly closer to the mouth than throat. Kaaf is produced with istifaalah  (lightness) or lowering of the tongue towards the ‘floor’ of the the mouth after the sound is produced. These two letters are referred to as Al-Lahawiyyayn  because their makhraj involves the uvula (called lahah or lahaatul halq in Arabic). The mid-tongue with that which corresponds to it from the hard palate produces 3 letters. Finally, it is also important to note that by mid-tongue we’re referring strictly to the upper side, called thahrul-lisaan . These three letters are called Al-Ahruf Al-Shajareeyah  because they emerge from what is called “Shajar Al-Lisaan“. This, simply put, means these letters originate from the ‘core of the tongue’. More often, the left molars only are involved in producing the daad as this is easier. Knowing the point of articulation and mastering it is important. Commonly, this letter is transliterated into dh which I find may be confusing, especially in words where the letter haa or haa follow. Example: the word ( أضحى ), as I’d spell Adhaa or even Ad-haa would then need to be written as Adhhaa but is often written as Adha. Complications can occur, but only stringent Arabic teachers (and alike) should take note of these and avoid them when teaching. The “gum” being referred to here is that which is behind the front molars, incisors and canines, i.e. the hard palate. Usually the righter side of the edge produces laam. Nevertheless, it is important to ensure the edges are producing the laam, and not just the tip of the tongue. Note, this document is found on the resources page. Read All About It Here….. 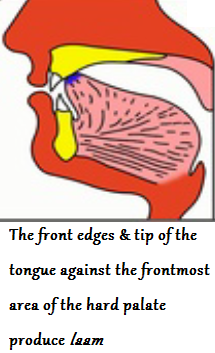 While pronouncing the letter”Laam”, if we use the tip of the tongue & its upper front part,touching the hard plate,the letter appears to belong to the group of AL- HUROOF AL-TARAFIYYAH, whereas if it is articulated by touching gumline of the upper eight teeth with edges of the tongue. as per another view,it is likely to be referred to as an Harf-e-Hafi like the letter “Daad”. Kindly let me have your opinion. Wa alaykum asalam wa rahmatullah. To be honest, I have not heard of this second opinion. I revised the tajweed books I have, and none of these have mentioned this manner of producing the laam – and probably because the most correct manner to produce the laam is the way it is mentioned above. The laam is grouped with the raa’, and noon, and this group is called Al-Ahruf (huroof) Al-thalqeeyah, because they are produced from thalq al-lisaan (i.e. it’s tip). I mention this in part 2 of makhaarij al-lisaan. I would suggest trying to keep the tongue away from the teeth, because producing it this way may cause a slurring in the recitation.